If there is one thing that "Doctor Who" is not known for, it would be comedy. Sure, there have been laughs throughout the 50 year span of the show, however a straight up funny episode hasn't graced the screens since the 1960s. Until now, that is. "Robot of Sherwood," penned by the brilliant Mark Gatiss, begins inside the TARDIS. After being told to pick anywhere in time and space to visit, a giddy Clara tells the Doctor that she's always wanted to meet Robin Hood. Trying to dissuade her choice, the Doctor tells her that Robin Hood is just a story and she'll be disappointed. Not even the tiniest bit tempted by the Ice Warrior encampments on Mars, Clara gets her wish as the Doctor sets the TARDIS controls to Sherwood Forrest, 1190AD...ish. To the delight of Clara, and the chagrin of the Doctor, the TARDIS has landed them right next to the Earl of Locksley himself, Robin Hood. He is appears exactly as movies and storybooks have portrayed him; brash, loud and constantly laughing. The Doctor is not a fan and asks Robin if laughing has ever gotten him punched in the face. Not too keen on this sour stranger, he tells the Doctor that he's going to steal the "blue box," and as we know, those are fighting words to a Time Lord. Robin draws his sword and the Doctor, unconventional as always, draws a spoon from his jacket. The pair duel, with no clear winner in the end, as they sort of best each other. No hard feelings, though, and Robin leads Clara and the Doctor to meet his band of Merry Men. Still not sure that everything is on the up and up, the Doctor is convinced that these people aren't real or perhaps they're in a Miniscope. Either way, he feels that something is about to go terribly wrong. While he investigates their immediate surroundings, Clara asks the Prince of Thieves why he is so sad. He wonders why she would think him sad, to which she tells him "the Doctor is right, you laugh too much." He tells her the tale that she has loved since childhood; his life story in a nutshell. He wants to be the man that he promised Maid Marian he would be. The Doctor steps in, interrupting their conversation, to find out what time of year it is. Despite being told that it was autumn, the Doctor believes that it is far too green and sunny ("Have you been to Nottingham?") to be normal. Miffed by the Doctors inability to believe that Robin Hood is the real deal, she asks him when he stopped believing in everything. Instead of answering, he asks Clara when she started believing in impossible heroes. "Don't you know?" is her solemn reply. Disguised as Tom Tinker, Robin Hood enters the Sheriff of Nottingham's archery contest, despite knowing it's a trap set up to catch him. After winning, Robin is about to accept his prize (a golden arrow), when another challenger splits his arrow down the center; the Doctor. What follows was a hilarious showcase of one-ups-manship between the pair, as they show off their archery skills. 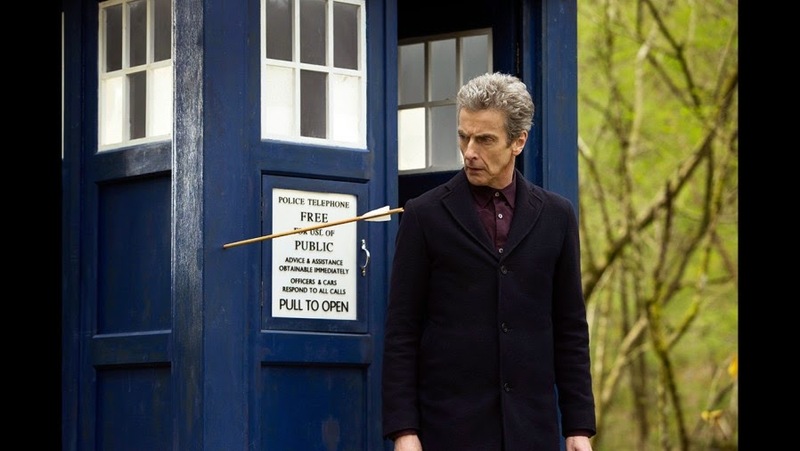 Growing bored of the silliness, the Doctor whips out his Sonic Screwdriver and blows up the target. When the Sheriff of Nottingham tells his knights to seize the Doctor, Clara jumps into the fight to help, and considering she's taken after school Taekwondo, everything will be fine. 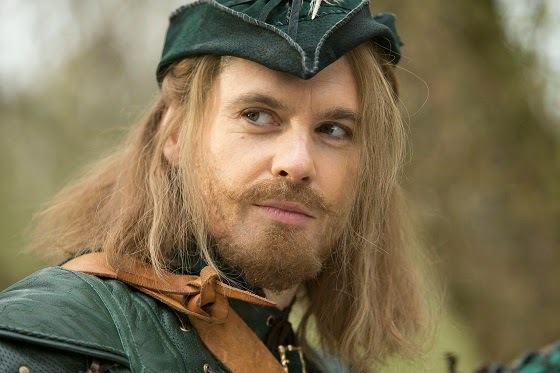 Robin Hood says that he's going to save the Doctor and reveals his true identity to the masses. He takes off after one of the knights and upon slicing off its arm, it is revealed that they are robots. The Sheriff then has the adventurous trio carted off to the dungeons, but not to fear. The Doctor reveals to Clara that this was his plan all along, because getting captured is the quickest way to find out what someone's plans are. Clever. Once shackled in the dark, dank dungeon, Clara asks what their plan of escape is, only to realize that she is locked in with a bickering pair of idiots. A guard comes in and tells them that, at the request of the Sheriff, he has been listening to their every word so he can discover the ringleader. While Robin and the Doctor argue over who is better at being interrogated, Clara is taken to speak with the Sheriff of Nottingham. While their leader is imprisoned, the Merry Men are back in the forest discussing the golden arrow prize. One of them brings up how strange it is that the Sheriff is only looting gold. Let us not forget the dungeon full of people being used as slaves to harvest said gold, nor the murderous robot knights that incinerate those that are too weak to continue carrying heavy loads to be melted down for whatever reason. Clara tells the Sheriff of Nottingham that she knew she was destined to be with a great and powerful man when she saw the lights in the sky, as well as the mechanical men with all their promises. He says that he had experienced these things as well, and proceeds to tell her his story. After years of being unappreciated by Prince John, a "skyship" crashed to Earth and the mechanical men that came from it saw the Sheriff as their leader. He then reveals that becoming the King of England is only the beginning, as he plans on becoming the King of the World. Robin and the Doctor escape, both very glad that Clara wasn't around to see how, where they make their way into a control room. As it turns out, the castle is actually a spaceship with an engine that is in desperate need of repair. Whatever could repair said engine? Oh, all that molten gold, of course! After some quick poking around of the databases, the Doctor discovers that the ship had originally been headed to the Promised Land. The databases also have the entire history of Robin Hood, which seems to cement his belief that Robin Hood isn't real. He doesn't take kindly to being called a robot, though unfortunately, the Sheriff and his robo-knights burst in and open fire, ending the argument. Robin Hood grabs Clara and jumps out of a window into the moat below, leaving the Doctor to be captured. The Sheriff tells the Doctor that he is planning to take the ship to London to overthrow the King and become the ruler, himself. Not too keen on this idea, the Doctor says that the ship isn't prepared for that kind of travel and it is, essentially, a radiation filled bomb that will destroy half of the country if they attempt to fly it before the repairs are complete. The Doctor is knocked out and taken to the work area. The Doctor relays his story to the beautiful woman beside him, in hopes to create a riot and stop the Sheriff from destroying half of England. After some epic shenanigans, they manage to defeat a hoard of robot knights. Back in the forest, Robin Hood demands that Clara tell him everything she knows of him and everything about the Doctor. In a brief exchange between the Doctor and the Sheriff, it is revealed that Robin Hood is not a robot. Still unable to fully believe it, the Doctor exclaims that "he is a LEGEND!" and in swoops the legend himself, along with Clara. The handsome knave begins to duel with the Sheriff, who, at some point, was made half robot. Despite losing his sword, Robin Hood uses one of the Doctors fencing moves and knocks the Sheriff into a vat of molten gold. The trio escape, but the robots still want to make it to the Promised Land. With a little teamwork, they shoot the prize golden arrow into the ship to allow it to take off, though it explodes just outside of the Earths orbit anyway. As Clara and the Doctor leave the Sherwood Forest, Robin Hood tells him that they are both legends and even though they aren't heroes, if they keep pretending to be, maybe others will become heroes in their names. He then bids the Doctor goodbye by saying that they may both be stories, stories that never end. 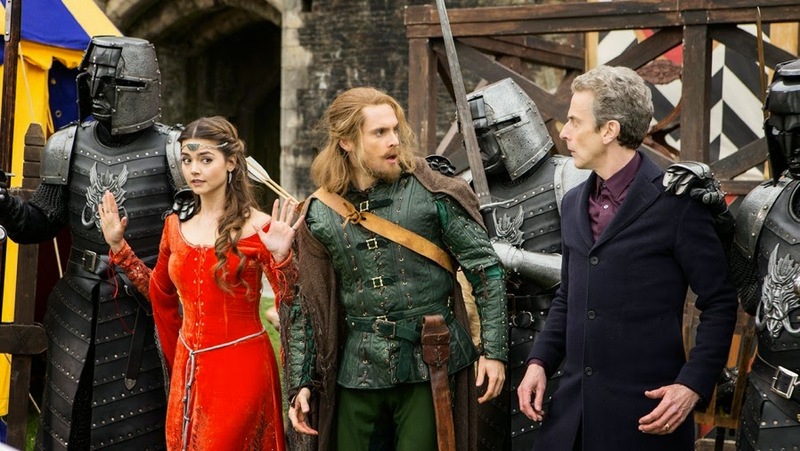 Once inside the TARDIS, Clara coyly tells the Doctor to admit that he likes Robin Hood. He replies, "Well, I'm leaving him a present, aren't I? "As the TARDIS disappears, the woman who helped lead the revolt in the castle steps out of the mist, and is revealed to be Maid Marian. 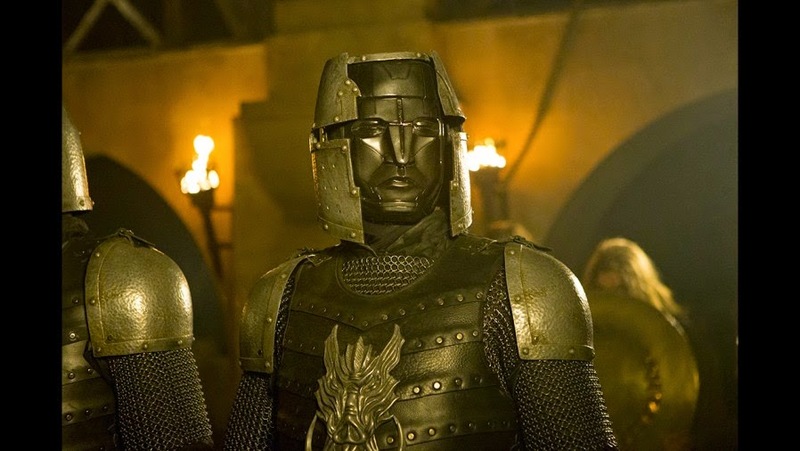 An extremely fun episode with tons of adventure and a few nods to the Classic Who years, "Robot of Sherwood" was an excellent bright spot in Capaldi's first few episodes. 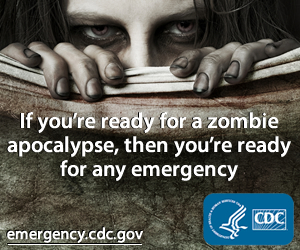 Don't get to comfortable with this light heartedness, though, as we are still waiting to go "into darkness."